I don't know the first thing about flowers and it was the thing I put off planning the longest, but Jocelyn made the whole process so easy. I described the colors, style, look & feel of what we were going for and she put together a style guide that identified a color palette, size/types of floral arrangements and the vases she recommended. From there it was easy to respond to and I felt comfortable that she understood my vision, even if I didn't have the floral vocabulary to describe it up front. Her detailed invoice line-itemed each and every arrangement, so we knew the exact cost and placement of each piece. No surprises. No sticker shock. (Very reasonable, too!) The results were gorgeous. 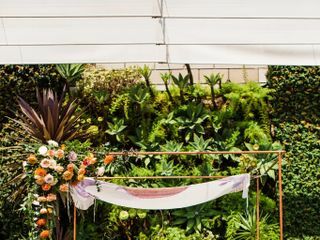 Every detail was just as planned, from the elegant table centerpieces, to the floral design for the chuppah, to the creative use of greenery to camouflage the outdoor misting fans. Jocelyn's passion for what she does and her eye for style really shine through. Jocelyn at 1703 Event Studios deserves all 5 stars (and then some) in every category. She was the most important vendor that we hired for our wedding. Her service and responsiveness was above and beyond expectations, day-of coordination was like a magic trick - she was in so many places at one time, and her ability to ease our nerves before the wedding is a truly unique trait. She is well organized, communicative, calming, experienced, and has a memory for details that is quite unbelievable. We also hired Jocelyn to do our centerpieces and florals. 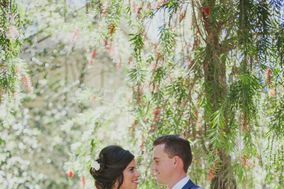 The bouquets exceeded anything I ever imagined, and embodied the romantic and whimsical feel of our wedding. Jocelyn knew us so well that she took some liberties to add some more florals to our cake and other areas of the ceremony, and nailed it! 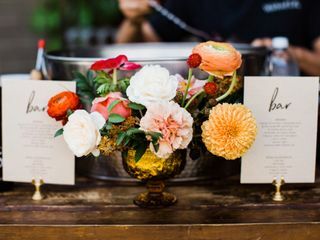 Most importantly, Jocelyn worked within our budget and was able to create florals and centerpieces that were a topic of conversation among our wedding guests. As I write this review a month after the wedding, our families are still raving about Jocelyn. They were so impressed with her work, as we are as well, and we all wish her the best as she continues to thrive and succeed in her wedding planning business. There are not enough words to describe how amazing Jocelyn was!!!!! She was on top of every tiny little detail and she went above and beyond to make everything amazing and me feel so assured as the bride that I didn't have to worry about a thing,.. On your wedding day trust me it's the best feeling!!!! I recommend her a million times over and over. She is amazing!!! I could not have asked for a better florist. Jocelyn totally got me & my style without me even having to explain in great detail. She was a referral from a friend and I'm so happy I went with her. She drove all the way to OC from LA in order to meet with me twice. Was extremely responsive and patient. She didn't get frustrated when I changed my mind. What really impressed me enough to book her was that she put together a proposal complete with drawings for me to review before even booking with her. My guests all said that our wedding was one of the most beautiful they have ever been to. Much of that beauty is owed to Jocelyn who designed an enchanted and romantic garden for us. My bouquet was like something out of a bridal magazine. I will say it was heavy, but well worth the weight for that wow-factor. I hope I can host another big party one day just so I can have Jocelyn come design it. What a gem! My only regret about hiring Jocelyn to coordinate our wedding was not having done so sooner! Even though she came onboard in "the eleventh hour" for our mid-August wedding, she dove right in, asking all of the right questions to catch herself up to speed and to help us identify areas we still needed to be thinking about (and there were a lot of them!). Once we started working with Jocelyn, a huge burden was lifted off my shoulders, and that alone made hiring her as a coordinator worth it. For day-of coordination, she did an awesome job of ensuring that everything ran smoothly and professionally, while keeping friendly, calm, and cool — which did a great deal to help keep me calm, too. She remembered even the smallest details and made sure everything and everyone were where they were supposed to be when they were supposed to be there. It was especially impressive since our reception venue was almost an hour away from the ceremony site. Her team was on top of it and did a beautiful job implementing the vision we had discussed. I even received several compliments from guests/bridal party about Jocelyn and her team. We also hired her to do our decor and flowers and I could not have been happier. The bouquets she designed for us looked like they'd materialized out of the Pinterest photo I'd shown her for reference. I was also so grateful that she heard our budget, never tried to upsell us on anything, and figured out a way to create something that worked perfectly with our vision and budget. Jocelyn was an incredible coordinator all around. I was so relaxed on the day of my wedding because I knew that she was taking care of everything. She is incredibly organized, professional, and kind, and made me feel at peace! All of the setup was done even better than I had asked, and she took care of every detail. Even months after our wedding, she followed up with me to ensure I had received my photos and video. I would recommend Jocelyn over and over again to all of my friends planning a wedding! My wedding day was a dream. I still look back on it and smile and one of the biggest reasons for this is 1703 Event Studios. Once you get engaged, if you are like me, a panic all of a sudden sets in that you have to plan a wedding. Not just any wedding. Your perfect wedding. I could not have done this without Jocelyn. She helped me realize our vision for the day and execute exactly what we wanted. She helped find all the vendors and worked with them directly so I had more time to focus on other things. She found me quality vendors that were in my budget that were all fantastic. She kept me on track and my stress levels very low through the whole planning process. She also did our flowers for the wedding which were breathtaking. The day of the wedding could not have been more perfect. I did not have to worry about a thing. All I focused on was the love, friends, and family. Jocelyn took care of EVERYTHING and it all happened without a hitch or any stress on me. My bridal party even commented how stress free it was and how they didn't really need to help with anything since Jocelyn had it all covered. They got to relax and enjoy the day as well which is rare. If you are wondering if you should save your money and not hire a wedding planner let me tell you it is worth every penny when you get the right person. More important than even the dress was having a perfectly planned stress free magical day. Thank you to 1703 Event Studios for giving me the perfect wedding that I will remember for the rest of my life. I highly recommend Jocelyn for wedding planning, decor consulting, and flowers. Several of my friends mentioned that their planner was great the day of but that they had very little interaction prior to the wedding. This was not the case with Jocelyn. She was constantly available by e-mail with professional, courteous and knowledgeable responses. 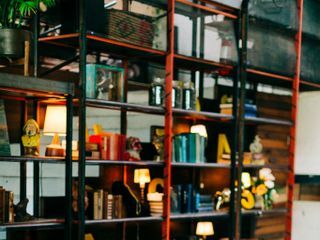 I used nearly all her recommendations on vendors and my expectations were exceeded. She consulted on several elements of design to ultimately deliver my dream wedding at a hacienda-style venue. Guests were blown away. The day of she helped by going above and beyond and actually delivering the cake to the venue when the other plan fell through. We loved Jocelyn! She did our flowers for our August wedding in 2014 and she was fantastic to work with! To put it simply, we were on a tighter budget than most typical Californian weddings, but still wanted to achieve the dreamy, romantic, Pinterest-look. Jocelyn recommended we save our favorite styles and flowers to Pinterest and then meet for coffee to review, which we did. 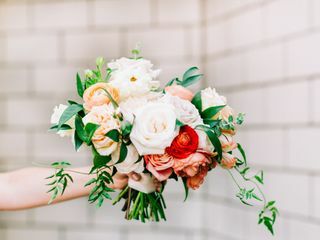 She was very knowledgable and understood our budget was smaller, so she was honest in telling us which flowers are most expensive, and found us similar substitutes that were just as beautiful and more affordable! She also helped draw up what the ceremonial space might look like and what arrangements and pillars we might use. She has a keen eye for design which was so helpful! And not only was she a wonderful person to work with who understood our needs, her arrangements for our wedding were BEAUTIFUL! The flowers were fresh and beautiful and the design was amazing (her website doesn't lie!)! I loved my bouquet and the centerpieces! (I wish I could upload photos here...). I've since recommended her to two of my friends who are engaged, and they are both working with her now! Booking Jocelyn as my wedding coordinator was THE BEST thing I ever did! She was a tremendous help leading up to the wedding and on the day of the wedding. Everything came together better than I could have imagined and I really didn't have to worry about anything. She dealt with vendors, logistics, timeline, layout, etc, etc. She was like a my wedding Fairy Godmother! I really don't think the wedding would have come together without her! She is simply amazing at what she does! I highly recommend her and her services. Oh yes yes yes, I highly reccommend Jocelyn Girouard to coordinate or plan your wedding. Had it not been for her our wedding would not have been so so successful. She listened to every detail and followed thru, she delivered. She was always on time. She is so proffessional her and her staff. She made the boquets for the bride and brides maids and they were AMAZING AND BEAUTIFUL. She was so helpful with suggestions and contacts. The reception was at our home and she left our home spotless. I honestly can't say enough about her. If you want a smooth hassel free non chaotic wedding the do yourself a huge favor "HIRE HER" HIRE JOCELYN GIROUARD. Thank you Lord for jocelyn. Jocelyn was able to make our corporate event look fabulous even on our limited budget. She took the time to understand what we were trying to accomplish with the evening and fit the arrangements in perfectly. I would definitely recommend 1703 Studios to anyone looking for floral. 1703 Event Studios was outstanding. Jocelyn and her team blew our minds and exceeded expectations by a mile. She was so easy to talk to, easy to get in touch with, and made our wedding perfect, going out of her way to make sure all the little details fell into place. In addition to planning and coordinating our stellar wedding, she also designed all our floral and table arrangements which looked BEAUTIFUL. Our jaws dropped when we saw what she came up. I would recommend 1703 Event Studios in a heartbeat. I know I put all 5/5 which can seem a bit like I just clicked that and didn't think about it, but if there was something higher than a 5, I would give it to Jocelyn. She was over the top amazing! My wedding was literally perfect. I gave her my vision, she took that idea and made it into the perfect scenario. My day went off with out a hitch. My bridesmaids and groomsmen both arrived to rooms with treats and little nick knacks that we might have needed for the day: bobby pins, breath mints, deodorant, etc... that was a total surprise and such a sweet sentiment. She did my flowers, and they literally were over the top beautiful and for such a good price. When you work with her, you get an amazing business woman, a sweet individual, and a talented artist. My wedding would not have been what it was it if wasn't for Jocelyn. People still talk about how beautiful and fun, and creative everything looked-- it was all her! If you're going to have anyone do your wedding. Pick 1703 Event Studios-- best decision I made and best thing I paid for in my budget!! Jocelyn is so wonderful to work with. I really didn't have an exact vision of what I was looking for, but once I gave her all of my ideas, she put it all together with exactly what I wanted. I have already recomended her and will continue to do so. She loves what she does and it shows. Truly a pleasure to work with. Jocelyn did an amazing job!!! This was really an area that I didn't have much desire to input. I told her what was important to me and other than that she could run with it. She really did a great job and it was so nice knowing that she was taking care of everything. She was so patient with me and willing to answer all of my crazy questions. The flowers looked gorgeous and served their purpose!